The Church of England has issued new guidance for parishes planning gender transition services to help transgender people mark their transition to their new identity. Since there is now no male and female in Christ Jesus (cf Gal 3:28), the Bishops are examining the possibility of developing specific liturgies for those who were once caught up in modern slavery but are now free. There are also demands for services for those who undergo racial transition – not only for Jews and Greeks, but black people who embark upon skin-lightening, and white people who self-identify as black to become “African born again“, adopting a name such as ‘Ekundayo’ in order to assert their new identity. Most importantly, however, because of the church’s overriding concern for inclusion and unconditional affirmation, and mindful of the appalling discrimination and abuse endured by Conservatives and other right-leaning Christians, pastoral guidance has been issued for use in conjunction with the Affirmation of Baptismal Faith in the context of political transition and ‘coming out’ as a Tory or Brexiteer. The guidance, which will be incorporated into Common Worship, encourages clergy to be “creative and sensitive” in using liturgy to enable people to mark this major transition in their lives. It formally commends the incorporation of the existing rite for the Affirmation of Baptismal Faith into services which mark transition from socialism or liberalism to conservatism. Equality legislation demands the inclusion of guidance for the opposite journey of transition, but there has, as yet, been no demand for it. The guidance details how elements including water and oil can be incorporated into the service and, crucially, makes clear that these people should be addressed publicly as Conservatives (pronounced: kənˈsəːvətɪv) or Kippers (pronounced: ˈkɪpə). As part of the service they could also be presented with gifts, such as a blue rosette or a copy of Charles Moore’s biography of Margaret Thatcher, inscribed in their name, or a certificate of life-long party membership, paid for by the diocese as a gift. It is important, the guidance adds, that the occasion should have a distinct “celebratory character”. 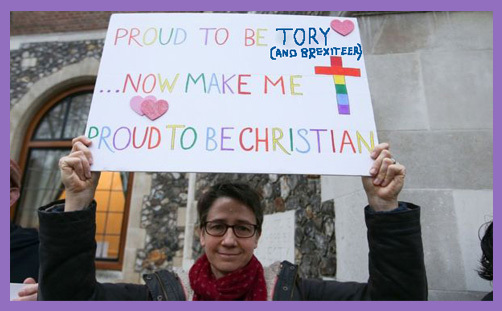 “The Church of England welcomes and encourages the unconditional affirmation of conservative people, equally with all people, within the body of Christ, and rejoices in the diversity of that body into which all Christians have been baptised by one Spirit,” the guidance emphasises. The document – approved by the House of Bishops, which is currently meeting in London – follows a motion overwhelmingly adopted at General Synod in 2017 recognising the need for conservative-inclined people to be welcomed and affirmed in churches. It was produced in consultation with the only four members of clergy in the Church of England who have a personal interest in this matter and who have also consulted widely with those directly affected. The rite for the Affirmation of Baptismal Faith is not a second baptism. The Church of England teaches that the sacrament of baptism is only to be undertaken once. But this service enables people to renew the commitments made in baptism and in a public setting and provides space for those who have undergone a major political transition (including ‘coming out’ as a right-winger) to re-dedicate their lives to Jesus Christ. The Bishops commend it for wider use.